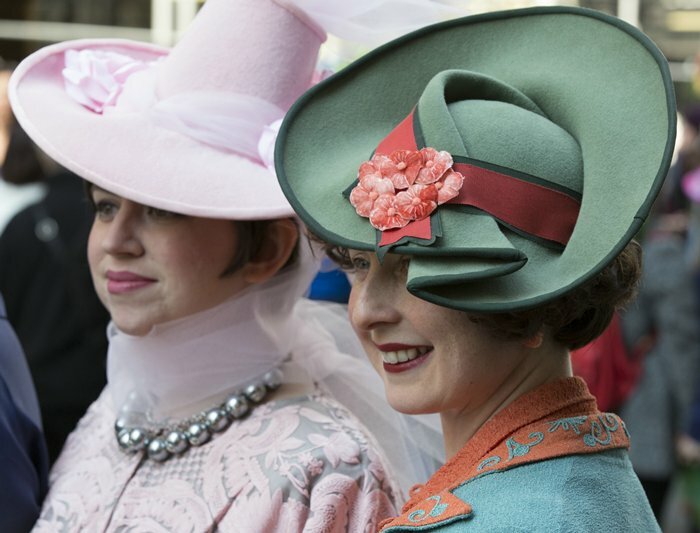 NEW YORK — Today’s Easter Parade is little like that seen on the iconic 1948 film Easter Parade, starting Judy Garland and Fred Astaire. What hasn’t changed are the throngs of people strolling 5th Avenue either to see or be seen. Those with the most eye catching head gear get swarmed by professional photographers as well as amateurs snapping pics with their cell phones and iPads. The parade, which began as early as 1870, is said to have once been a reflection of American prosperity but it has since been transformed into something that looks more like a representation of American creativity. While the sophistication of dawning one’s Sunday best has not totally been lost, the specialty ladies bonnets and three piece suites are few and far between. Home crafted hats dominated the scene from simple to extravagant. Simple included the obligatory flowers, plastic Easter eggs and stuffed bunnies but of course there were those that took weeks or months to be made. 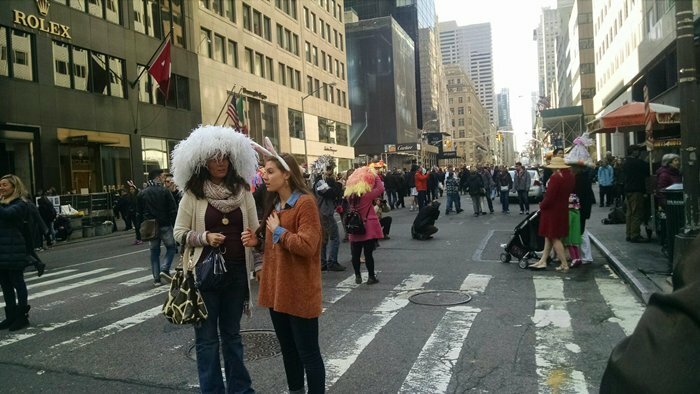 One woman sporting an eighteen inch egg atop her head that read “I (heart shaped fried egg emoji) NY”, playing off the popular New York state I love NY logo, told me that her hat took her two weeks to make but that was far less than the two months it took her to make the hat she wore in 2014. While the majority aimed for one-of-a-kind looks, bought or hand-made, there were clearly hundreds of people wearing unique yet oddly similar oversize hats primarily made of some kind of paper product. In fact these were made of some purchased paper products but also of Whole Foods shopping bags, recycled or reclaimed paper, cereal boxes, and even parking tickets and they were all made by one person. Why? Just because. 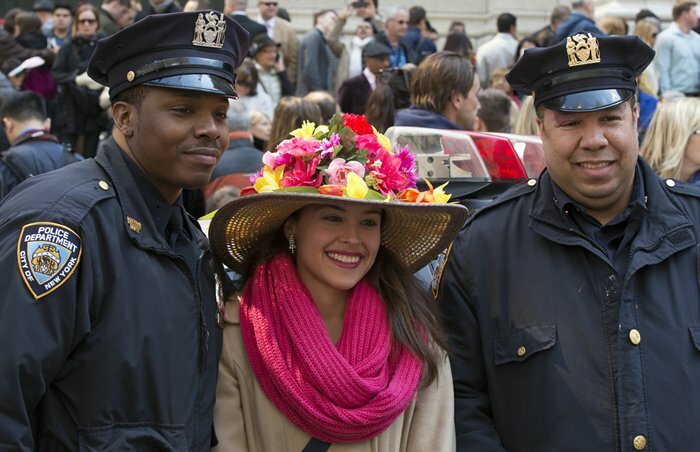 His name is Andy Padre and he has been making and distributing free hats to Easter Parade goers for the past four years. When I spoke with him there was a small, relatively courteous mob clamoring for one of his hand-made creations. As we talked, men and women were handing their chosen hats over to him so that he could size their paper hat bands using a heavy duty stapler. Mr. Padre handed out an estimated 400 hats this year of which it took him nearly a year to make. While he did have some assistance from friends who helped to make the hats he worked alone to refill the hat supply and size hats during the Parade itself. When asked why he does it, Mr. Padre said that he is Lutheran and that that is part of it, but mostly he keeps doing it because of the people he meets, particularly those who get excited about his work and keep it going in their own way.